Brittle stars are very closely related to starfish or sea stars. Like starfish, brittle stars are echinoderms. However, brittle stars have thinner, more fragile arms than true starfish do. In addition, brittle stars are more agile than starfish. Both starfish and brittle stars are capable of moving very quickly, but brittle stars are even faster. Brittle stars are so named because their arms break off so easily. 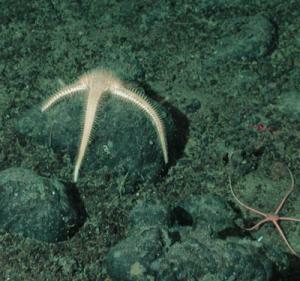 Their arms also differ from starfish in that they don't have suckers or tube feet on the undersides of them. Brittle stars also usually have spiny extentions on their arms. Brittle stars can regenerate lost arms, which is good since they break off so easily. Their arms are so fragile they sometimes break off when they are handled by aquarists. This is actually a defense mechanism - the brittle star would rather lose an arm than be captured as someone's prey. Many brittle star species hide in crevices or holes in rocks on the reef, whereas others live and hide among sponges or sea urchins. Some even bury themselves in the sand or other substrate. Brittle stars are mostly nocturnal animals and so they feed mainly at night. They usually hide during the daylight hours and aquarists don't often see them when the lights are on. Brittle stars are good animals for scavenging leftovers and cleaning up the aquarium, especially in hard to reach areas. They mostly feed on dead organic material, however, some large species will even feed on feed on bivalves (e.g., clams, oysters, mussels) and sometimes even on small fish or shrimps. Most brittle star species kept in the home aquarium feed on detritus and other decaying material unless they are underfed. Although they may find enough food in the tank it is still a good idea to feed them directly as well. Brittle stars are omnivores - eating both algae and meaty marine foods. In captivity they should be fed finely chopped meaty marine foods (shrimp, squid, marine fish, frozen marine fish food, mysis shrimp) and algae. They will also eat detritus and other material off of well established live rock. The mouth of brittle stars serves both to ingest food and to expel waste products. It is located on the underside of the brittle star's body disc. See the short You Tube video below to see a brittle star accepting food from feeding tongs. In some species of brittle stars the sexes are separate, but some species are hermaphroditic. Sperm and eggs are often released directly into the water. Some brittle star species also reproduce asexually. Copyright © 2008-2019 AboutFishOnline.com. All rights reserved. Image of brittle stars from Wikimedia Commons. Photo originally from the U.S. National Oceanic and Atmospheric Administration, and released into the public domain because it was taken or made during the course of an employee's official duties.